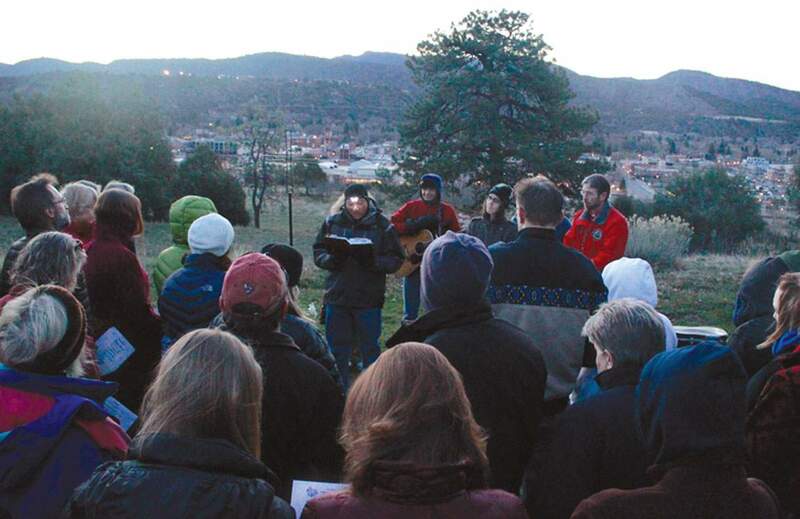 Church member Bruce Nye begins Christ The King Lutheran Church’s Easter Sunrise Service with a brief reading in 2012. Area churches will be celebrating Easter over the weekend. Easter weekend services at Durango, Bayfield and Ignacio churches are listed here. All services are on Sunday unless otherwise noted. Services with an asterisk mean child care is provided. CALVARY PRESBYTERIAN CHURCH, 89 East Mill St. in Bayfield. Potluck breakfast, 8:30 a.m.; Easter service, 10 a.m.
FIRST BAPTIST CHURCH OF DURANGO, 332 E. 11th St. Easter services, 9 and 10:45 a.m.
FIRST PRESBYTERIAN CHURCH OF DURANGO, 1159 East Third Ave. Easter worship services, 9* and 11 a.m.*; community brunch and Easter Egg Hunt, 10 a.m.
FIRST SOUTHERN BAPTIST, 1715 West Second Ave. Continental breakfast, 9 a.m.; Easter service, 11 a.m.
ST. COLUMBA CATHOLIC CHURCH, 1830 East Second Ave. Holy Saturday Easter vigil, 8 p.m.; Easter Mass, 9 and 11:30 a.m.
ST. IGNATIUS CATHOLIC CHURCH, 15449 Colorado Highway 172 in Ignacio. Easter Vigil Mass, 7 p.m. Saturday; Easter Mass, 10:30 a.m. No Mass at 5:30 p.m. Saturday. ST. MARK’S EPISCOPAL CHURCH, 910 East Third Ave. The Great Easter Vigil, 9 p.m. Saturday; Festival Eucharist, 8 and 10:30 a.m.; children’s Easter egg hunt, 9:45 a.m.